As I’ve done for the last decade and a half, I spent the first week of Miami at the art world’s “big dance” or the Art Basel Miami week of art fairs – about 26 of them by my count – and just as I did last year, since I was confined to working at the fair that Alida Anderson Art Projects has done for the last seven years (Context Art Miami), I asked Texas ubercollector Ardis Bartle, who is a major art collector and also a VIP at all the fairs, to report her observations of the key things that her trained eye caught during her visits to multiple art fairs. But before I hand it off to Ardis, a couple of quick observations on the fair that I was working my buns off to place art by multiple artists in as many collections as possible (Context Art Miami). 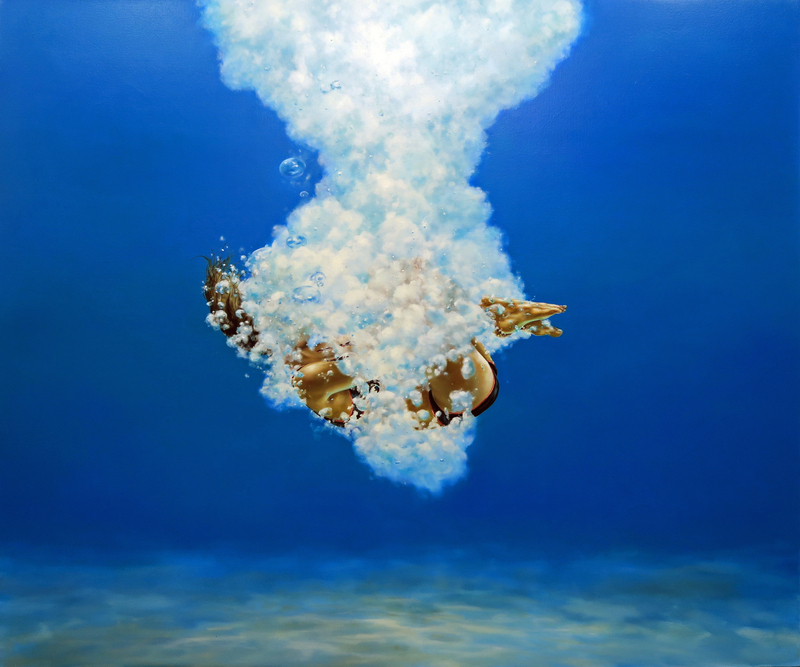 Context Art Miami: At Gallery Henoch, I loved Eric Zener’s Cradle – one can feel the power of this dive, and the spectacular blue punches the solar plexus of the mind as much as the diver’s punch of the water surface. By the way, this gallery was full of talented artists. At Art Spoke, Scott Scheidly steals the booth with his portrait work – I’ve admired his work for a long time now… and he really delivered some brilliant new paintings to this fair – with really good price points. Note: As it has been the case for the last couple of years, the Trumpinator is all over the fair, the subject of many artists… but no one does DJT better than Scheidly. Scheidly also has a portrait of the Galician mass murderer and suffocater of the Cuban people once known as Fidel Castro, who also makes an appearance in Scheidly’s talented universe. Another gallery which was full of terrific artists was Ten Contemporary, but I was particularly taken by the sculptures of Max Leiva. Overall impression of the week: The galleries which brought fresh new work, not older blue-chip work, experienced collectors open to expanding their collections, as well as art museums seeing the new possibilities. Also, artists like Kusama and Murakami, were not as visible as artists like Christo, Rosenquist, all of whom are seeing a new round of respect. The print market was extremely strong with collectors at Art Miami, Context, Untitled, Ink and Art Basel vying for prints from artists from Robert Longo to Mary Corse. Finally, NADA fulfilled its promise by bring in new experimental art. NADA Miami – Eva Sussman gave multiple talks with her team on the atomization of 89 seconds at Alcazar, the Sussman video that stole the show at Whitney Biennial in 2004. Her team has atomized the video into 2.304 pieces. Each “atom” is irrevocably tied to a blockchain, and thereby creating a new art work: 89 seconds Atomized. This writer went to the website at Snark.Art and purchased one atom for $120 @ https://snark.art/drop. Eva showed the audience that each atom is one of 2.304 pieces of the video, unique and with the 9 minutes of sound. At any time, one owner of an atom can request the other atoms to participate, and create a new work. The concept of group ownership of a living experiment in art was one of the exciting (and affordable) news at NADA. INK MIAMI – Mixographia showed Analia Saban “Three Stripe Hand Towel with Hole and Unsewn Label.” She is best known for dissecting the works themselves and known for using laser cutters, silicone molds and acrylic and erosive techniques. Graphic Studio showed William Villalongo Embodied, laser cut felt with archival pigment print. Since most of his work is usually with black velour paper, the felt provides a renaissance work to the piece. PULSE MIAMI – Perez Museum purchased work from galleries at Pulse. Included in their purchasing was Michael Waugh from his exhibition Trust in Me. Michael Waugh uses dense text for these beautiful drawing composed entirely out of tiny handwritten words copied by the artists over months of meticulous labor. The result is an elegant filigree of written lines which finalizes into images. The artist explained that his technique has the basis in micrography. His images are demanding and require considering more, not less. ART BASEL – Galleries provided some interesting artists such as Joyce Scott and her award-winning bead works at Peter Blum Gallery, Mary Corse new line of prints (not released yet) at Pace Prints, as well as Christo and Jean Claude which had their own “Pink Islands” exhibition at the Perez. ART MIAMI – After the HBO documentary, The Price of Everything, it was good to see Larry Poons at Yares Gallery. Lewis Wexler’s Sol Lewitt sculpture was a beauty, and attracted a lot of attention. Joyce Pensato had some stunning work at Waltman Ortega. The Video at Pontone Gallery by Lee Leenam, portrays how he moves through both classical and contemporary art history, and gathered a significant amount of traffic at the booth. UNTITLED – When the doors opened for VIPs on Tuesday, the collectors ran to Cirrus Gallery/Cirrus Editions booth to purchase one of the 80 Matt Bass prints. This writer was informed that the edition sold out in the first hour. Remarkable Daniel Zeller at Pierogi, again focused on the hand drawing skill of the artist. DESIGN MIAMI – The KAWS chairs (yes, all three of them) were sold out within minutes of opening at VIP party. At $75,000 the chairs were a crowd pleaser, and reminded many of Kusama chairs in the 1960s. Fendi’s resin water sculptures by Sabine Marcelis were fascinating. Adding to the new private museums, Atchugarry Art Center provided a gorgeous show for Jose Pedro Costigliolo and Wilfredo Lam. This private museum is well worth a visit and is added to Rubell, Margulies and Cruz Collection. Art Basel Miami week of art fairs returns in 2019, as usual, during the first week of December!